Filipino Carats endured the long lines just to see the boys of Seventeen. 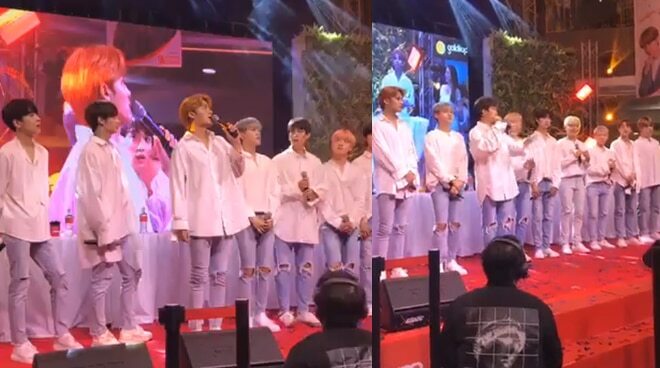 After performing for their Pinoy fans at the sold-out Ideal Cut show at the Mall of Asia Arena, K-pop group Seventeen held a fan meeting at Robinson's Galleria. Several fans flocked to the venue, notwithstanding the long lines just to get a glimpse of the boys. Apart from the fun games and surprises, lucky Filipino Carats also had the opportunity to have their photo cards signed by the boys of Seventeen. The Seventeen fan meeting was part of their commitments for popular South Korean beauty brand The Saem. Seventeen is known for their several hits including "Adore U," "Don't Wanna Cry," "VERY NICE," "Mansae," and "Pretty U." Composed of 13 members, the group is divided into three sub-units namely the Hip-Hop Unit, Vocal Unit, and the Performance Unit.